What a lovely spot and the best view ever! Place looked exactly like pictures. Had everything we needed. Beds were comfortable. We loved the fire pit and empty beach to explore at low tide. Very close to cute town of Langley and minutes from ferry. Will definitely come back. Thank you for you comments. We are so happy you had such an awesome time on Whidbey Island! We are glad you found your stay enjoyable, "comfortable", you "loved" your stay with a "perfect view". When you plan your next stay we will be happy to assist you. Great oceanfront view. Our visit was in early October all other rental homes were unoccupied so we had the whole block to ourselves. Had the beach to ourselves. Kitchen was well stocked with dishes and pots and pans. House was clean and well kept. Unfortunately, the sofa is pretty worn out and should Be replaced. Would have been nice to have firewood since the fire pit was so inviting. I’m satisfied satisfied with my Saturns would stay there again. Thank you for your comments. We are happy you had an enjoyable stay on Whdibey Island. We hope we can help you with your next stay on the Island. Great location. Close to both Clinton & Langley,with plenty of dining & shopping options. Perfect for dropping our Kayaks.Saw many Seals + Bald Eagles. Thank you for your comments. We are happy the location you stayed at on Whdbey island was "perfect". We hope we can help your with your next stay on the Island. We LOVED this cottage - it truly was a charmer. We needed quiet and the beauty of the sea and this was exactly right for us! Thank you for your comments. We are happy your "LOVED" your stay on Whdibey Island. We hope we can help you with your next stay on the Island. The home is all you could need and located conveniently. The views and beach access at low tide were absolutely perfect. We enjoyed the hammock every day and the fire pit as well. Only improvement would maybe be the addition of black out curtains in the master. Boy, that sun was bright at 5:30am and made it hard to get good, vacation-style rest. Thank you for your comments. 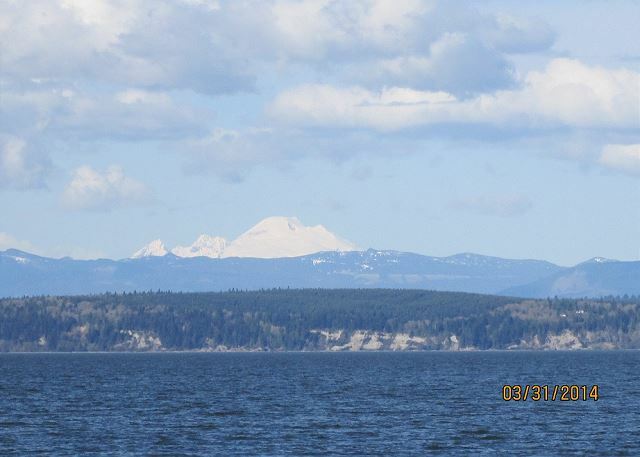 We are happy you enjoyed your stay on the Whidbey Island and hope to help you with your next stay. We will pass on your comments to the owner about the curtains. Nice beach house that’s right on the water. You can tell the house was recently renovated. Getting there involves descending a somewhat intimidating private drive/hill; but be brave, the drive is worth it. And if you want to use the fire pit, bring your own wood and matches. Go see the adorable bunnies in Langley!!! Thank you for your comments. We are happy you had a nice stay on Whidbey Island and hope you return often. This house was ideal for our weekend get away. Conveniently located minutes from the ferry. The house was clean and the decor was adorable. Nice deck and lower area with fire pit and easy access to the beach. Main bed room has a balcony off of it which is nice. We even spotted a whale on our last day there! I would certainly recommend this place if you are looking for a quiet place with great views. 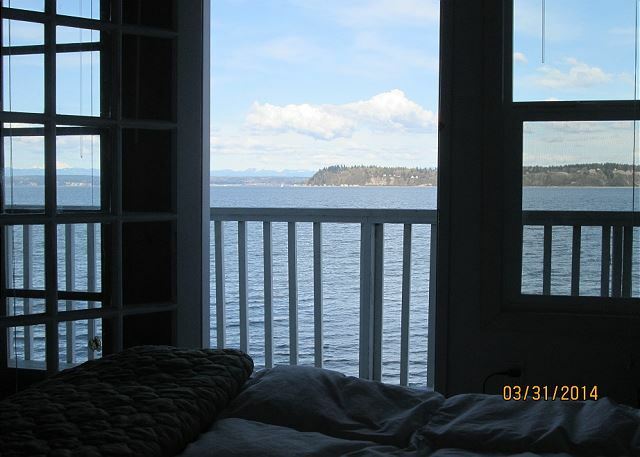 Sounds like this was a perfect vacation home for your visit to Whidbey Island. We're always happy to hear when our guests get to see the whales and nature while here. Thank you for your review. 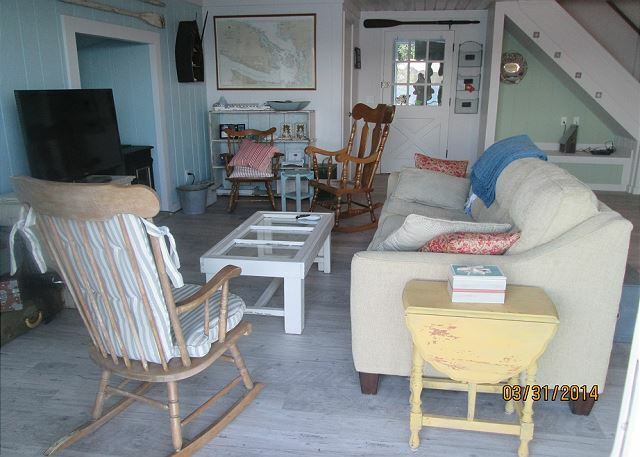 The location was great and as described, on the beach at high tide water is right up to the property. View is awesome. Hamock and porch are great place to relax. Kitchen supplied with necessary cooking and eating but did lack paper towels and limited basic supplies. Seemed like at the mercy of previous guest left. Wifi do not count on it we couldnt get at all. They should also let people know if they are mobility limited not the place for you. Stairs to bedrooms are steep and narrow. Glad to hear you had a good time and we'll look into adding info about the stairs and mobility issues. Thanks for your review. 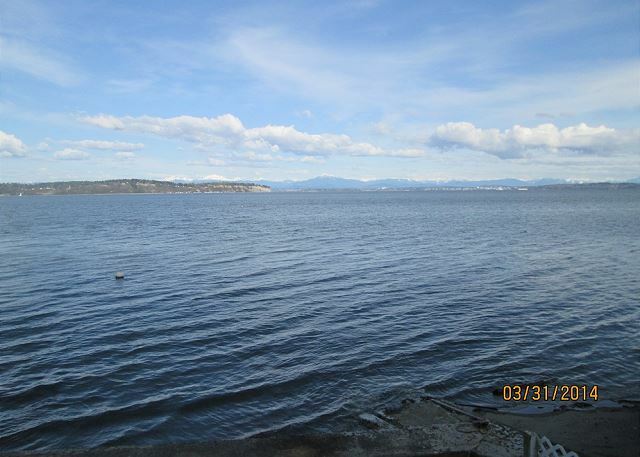 Great on the beach rental - high tide comes right up to the sea wall!. Very clean overall and nice, updated kitchen. Fantastic view from the master bedroom. Nice rural area. Great for a quiet gateway. Thank you for your comments. Is seems that everything went well with your stay on Whidbey Island. We hope we can help you with your next stay on the Island. What a great find. So peaceful and relaxing. Thank you! Thank you for your review. Happy to hear you had a very relaxing time on Whidbey Island. We were just looking for a quick, easy and relaxing getaway for a few days. This was perfect! We couldn't have been closer to the water, whales and other wildlife were abundant. Nice firepit and outside decks. Inside dining furniture (stools) were not too comfortable. Otherwise well stocked and comfy. Nice to hear you got to have a nice weekend getaway. We have some fabulous wildlife that everyone loves to watch and observe. Thank you for your review. This was just what our family needed...the home was peaceful. We enjoyed being right on the water. The best part was we saw Gray whales every day! One was right off our shoreline about 15 feet. For all of us, it was an experience of a lifetime. I loved the quietness being there in an "off-time." It made the trip more enjoyable. The home had everything we needed and more. My girl especially loved the firepit for smores. I highly recommend this home. Thank you! Thank you for your review! We are happy to hear you loved this vacation home and got to see some whales. There is a great variety of animals to see on Whidbey Island. Wonderful retreat very close to where we arrived on the ferry made it an easy arrival late at night. The house is wonderfully appointed, the living room is comfortable and the pellet stove made it cozy on a rainy day. Bedroom was perfectly clean and comfortable and the views were wonderful. A great quiet escape close to wineries and distilleries on the island. Definitely recommend. There's a steep hill going down to the cottage, so if you have an all wheel drive car all the better if it's slick. Enjoy! We are happy to hear you loved the home you stayed in and were able to visit some of our many wineries on Whidbey Island. Thank you for your review. Awesome! Wet but lots of wildlife. Great kayaking from the beach over to Langley and back. Thank you for your review. We are very lucky on Whidbey Island to be able to watch deer, eagles, bunnies and much more and that our guests can take advantage of that also. Nice to hear you enjoyed your stay. Absolutely loved the location and the beach house decor! Fire pit outside was a huge hit as were the amazing ocean views. House was fully stocked and clean and well maintained. Langley is also a lovely town and he had fun exploring the shops and wine tasting. We can't wait to come back! The only disappointment was the pellet fireplace either didn't work or we couldn't figure it out. We loaded pellets and hit the start button as the directions said but it never worked? My guess is it's broken. If not you should really post easy step by step instructions and trouble shooting. That is honestly the only complaint at all! Thank you for your comments. 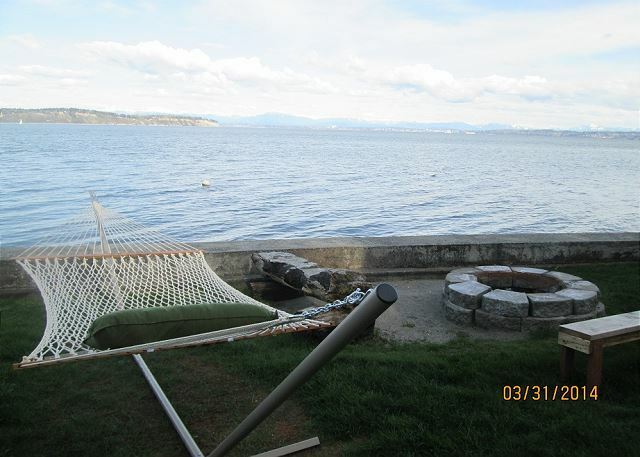 We are glad you "loved" the home you stayed in on Whidbey Island, enjoyed the fire pita and "loved the amazing ocean views". We hope to help you with your next stay on Whidbey Island. The house is great! It is right on the beach which we loved!!! The house is comfy, has everything you need with a great view!! The DVD player was not working and the property manager dropped off a new DVD player that night (it was late Saturday night too) can you believe that?? Incredible! Cant wait to go back! We are grateful for your comments. We are happy you "loved" the location and the house was "comfy" and had everything you needed, we were happy to help you with a DVD player. 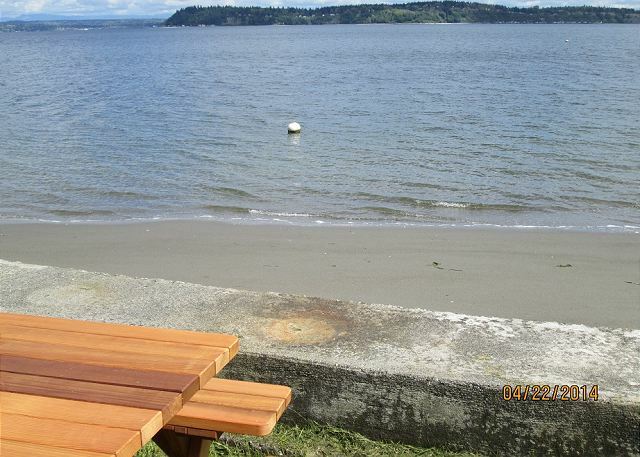 Hopefully we can help you with your next stay on Whidbey Island. My family came to visit me on Whidbey, and we just had the most serendipitous time! We loved falling asleep to the sound of the ocean every night and enjoying breakfast on the bulkhead. The house is absolutely adorable and had everything we needed. It was the perfect home base for our Whidbey Island adventure. Thank you Tara Vacation Rentals! Thank you for your comments. We are happy that your expectations were met, the location was "adorable and had everything" you needed and was "perfect". We hope to help you with your next stay on Whidbey Island. We could not have been more pleased with the house and the experience. On the beach with a view of mountains, minutes away from Langley or a short ferry ride back to Seattle or scenic drive up to Anacortes. The house had all the amenities you could ask for WiFi, Sat TV, outdoor grill and fire pit. This was one our all-time favorite places to visit! We are so glad you had such a great time! It's good to hear that the location and amenities provided met your needs. Come back soon! Thank you for your review, your feedback is important to us. The Seaside Charmer was just what we needed for a family getaway. The house is nestled in a beautiful location; with views that are amazing! During high tide we walked the beaches and at low tide we felt like we were floating on a boat. From the porch we watched gray whales! We were visited by seals and a variety of birds, including bald eagles chasing seagulls! The house is equipped with everything we could possibly have needed for our visit. 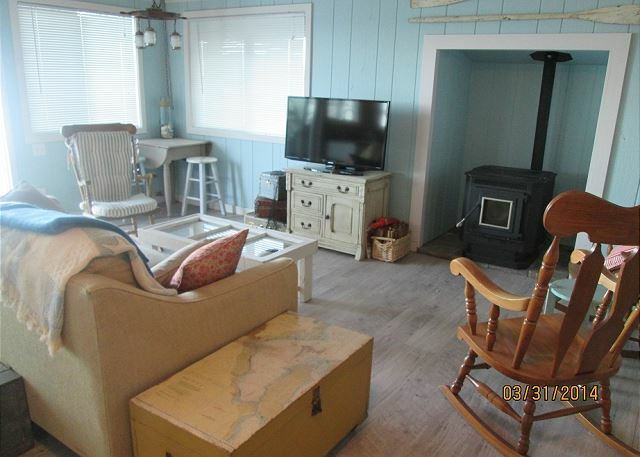 This home is inviting and comfortable; plenty of space for a family to enjoy a weekend at the beach! We will be back again. We're so glad you had such a great trip! So happy you got to enjoy some spectacular wildlife. We're glad that the home and the location met your needs. We look forward to you coming back! Thanks for your review! We really enjoyed our stay. Waking up to the sound of the waves was so relaxing, and the house has a nice view of the Cascades across the water (including Mt. Baker on a clear day). The living room couch is a bit uncomfortable--it seems old, so it might be time to replace it--but everything else was perfect. My husband and myself , with two 11 year olds had a wonderful time , everything was nice and we enjoyed ourselves very much , the only thing missing was a hot tub ! Maybe they will put one in , this rental we will use again and even in the winter , it's s beautiful quiet spot and easy for us to use regularly ... Tara Rentals was very helpful and super easy to work with , we will definetly use them again ! Thanks for your review. Happy to hear your family enjoyed your visit to Whidbey Island. We stayed here for 2 weeks and was fun as the tides made the beach new each day. We loved having the fire pit. Kitchen was well equipped. Great to have laundry facilities. My recommendation is to find your way here during daylight hours the first time. It's narrow and a bit tricky until you've done it a couple times in daylight! There were little improvements needed...birds left droppings all over deck and hose was not working to clean it off. More comfy furniture in living area and a table to eat. (There was one to roll in but was broken.) All in all though, it was clean and a beautiful setting. We're glad you enjoyed the beach and daily tide changes. We will forward your comments regarding the furniture to the owner. Due to the small living space, we don't have a table up all the time and will check on the one with wheels or replace it. Thank you you so much for your review. We had a wonderful relaxing time. The beach house was just what I loved. Kind of rustic and beachy. Very nicely decorated. The bedding and pillows were very comfortable too. Would like to retun. So glad you enjoyed your stay! Thank you for your review! This house was amazing and the views were stunning. Waking up to some of the most spectacular sunsets and enjoying the quiet stillness of the bay is something we cherished every day we were there. The house was very clean and when we needed assistance with getting pellets for the stove and a blow dryer to use, Tara Realty was there to help us and anything we needed. We enjoyed fires in the outdoor fire pit and playing games on the grass and long walks on the beautiful beach. The bed in the master was comfortable however the beds in the second bedroom could probably use new mattresses. 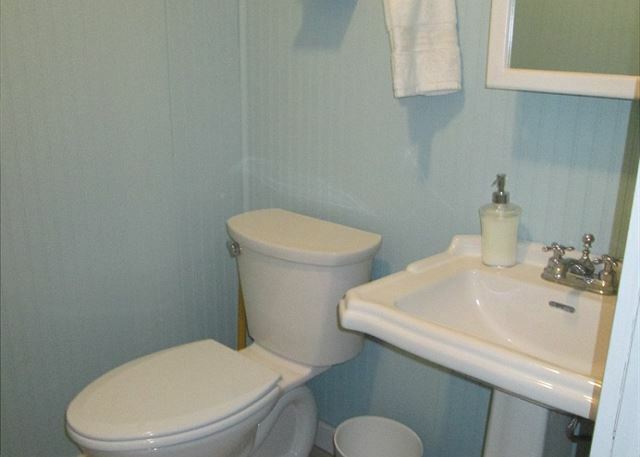 The upstairs bathroom was a bit dark and dated but functional and met our needs. The kitchen could use a few more serving bowls & platters and a better can opener. Other than that the house was perfect for our family of four and the view from the living room and deck were simply spectacular. We would definitely return here again in the future as it was one of the most relaxing & beautiful locations we have encountered. We enjoyed visiting the adorable town of Langley as well as Greenbank, Coupeville and hiking the beautiful trails of Deception Pass. So much to see and do but always so wonderful to come home to our cozy cottage by the bay. The tide literally came up to the house and you felt as though you were on a houseboat at times - so amazing. Can't get closer to the ocean than this!!! Thanks for an amazing time. This was definitely a Seaside Charmer. We will be back! Thank you for all of your helpful comments! We're so glad that you were able to enjoy the nearby tourist spots, the bay, and the sunsets. We're also glad that the house met your needs. We'll mention the mattresses, the kitchenware, and the bathroom lighting to the owner, and we'll fix what is needed. Thank you for your review! We had an absolutely fabulous time at this house. We had all of these pre-planned excursions but once we arrived decided we'd rather just stay home and enjoy the house and all it has to offer. The views are absolutely stunning, the beach was a blast. Nothing beats being on the ocean. NOTHING! The house itself has a great open floor plan. The porch was comfortable and the yard offered plenty of space to hang out on. The house was just amazing. We are definitely staying there again! We are so glad you had such an enjoyable stay! Thank you for your review! What a perfect beach setting - and I mean gorgeous beaches. As a child, I lived on the island for ten years and wanted to come back to Langley and the beaches I played on, the village I spent my younger years in. This sweet beach house was so perfect. And it is RIGHT on the water. With nautical and beachy décor and colors, we just felt relaxed the moment we got there. The views are amazing from both main floor and the master bedroom. The Saratoga passage, Hat Island and Everett provided a pretty light show at night. The tide rolling in and out, with waves lapping at the sea wall, was just the thing to put you into a peaceful slumber. We slept with the windows open and woke up with smiles each morning, at the sound of the water. Just a few minutes from the Clinton ferry docks, near a grocery store, gas station and restaurant in Clinton, everything is right there. But be sure to go to Langley, just ten minutes away! The cabin itself is well-stocked and appointed, with everything you need. Just bring food, beverages and toiletries, and you are all set! It is older, but clean, even a full-size kitchen, with wine glasses/corkscrew and all you need. Supplied are extra blankets, beach towels, washer/dryer, a nice deck with chairs and BBQ. At the Clinton grocery, you can purchase kindling and firewood for the fire pit, or gather driftwood which is in abundance. Walking the huge beach is just delightful each day, at low tide. And high tide comes right to the sea wall, almost giving the feeling that you are on a boat! This was the restorative break from the grind that we truly needed and we will be back. I've recommended to friends, two of whom have already booked. Thank you so much for such a peaceful time to reconnect with my husband. I highly recommend the Seaside Charmer! We are so glad you had such an excellent time! Thank you for all of your detailed comments. We really appreciate your review! Comfortable and charming for sure. Loved it perhaps as much as Hawaii. Thank you for your review! We are very glad you enjoyed your stay. had three lovely days. We enjoyed the sunrise every day. This is the perfect place for a couple. It was a little tricky finding the heat. We enjoyed the pellet stove though. We also had a fire one night in the fire pit. We would come back! Thank you for your review. We have added instructions to find the heat easier. This place is awesome. We spent a girls weekend here. Great ocean views. Super close to Langley. The kitchen is well stocked and clean. The neighbors are friendly. The house has everything you need for a comfortable stay. We would for sure book this again! We were pleasantly surprised to arrive to a beautiful, quiet location. The house was clean and looked even better than the pictures. As most people describe it feels like you are on a boat when the tide is in and there is tons of sand when the tide is out. Our four year old had so much fun digging and building in the sand. Relaxing in the hammock listening to waves was a favorite. Would love to see a king size bed and maybe some newer more comfortable mattresses but other than that the place is spectacular and we hope to return. The house was perfect for our family of four. Very comfortable and well equipped. We have no complaints and hope to visit again. Tara properties really went the extra mile for us, too, to help make our stay more pleasant. We couldn't have been happier with this house! You can't get much closer to the beach, as the ocean is right in your back yard! When the tide was low we were able to explore and our toddler had a great time finding shells and rocks and playing in the sand. The house is well taken care of and really looks just like you'd imagine a beach house to look, with shabby-chic furniture and beach décor. We can't wait to go back! We were thrilled with the property. What a bargain for a beach front home. The recent remodel is quite appealing. The home was perfect for our family of 3, but I think a family of 4 would be quite comfortable. There are adequate beds for 6 but there is only 1 shower. The home is about a 8 minute drive from Langley and about 5 minutes from the Ferry. The beach is terrific - a sandy beach but there are areas of rocks and shells for beach hounds. Our daughter loved playing on the beach. Of note, the beach does disappear completely at high tide. We would definitely return again and hope to in 2016. Exceeded our expectations. House had everything and more. Beautiful view, wonderful accommodations, extra touches. $80 check-out fee, just a little high. What a great house for a weekend getaway. It felt like a Pinterest board come to life :) The house had everything we needed for the weekend and was more spacious than I expected. My friends and I came to Langly for a weekend getaway and this location was perfect! It was quiet, relaxing, and peaceful. During the day we spend time on the hammock, laying in the grass, and taking walks on the beach. The fire pit was a great feature for our evenings! We used the grill and a ton of kitchen utensils; everything we needed was readily available and I'm so glad we didn't have to bring all that stuff with us! My only disappointment was the bed I slept in. I slept on the queen mattress in the second bedroom. I like firm mattresses but this mattress was really rough! I debated sleeping in the hammock over night! Everyone else seemed to be okay in their beds though. Grocery stores, farmers market, and good restaurants are just a short drive away! Very enjoyable. Weather reports had been threatening, but did not manifest on our side of the island, much. Loved the proximity to the water. Spent the evenings sitting around the fire pit watching the tide change. Only downside to the whole trip was have kayaks there that we could use because they were chained up and that the DVD player unavailable. The rooms were comfortable , clean and the entire place was well maintained. Would definitely come back again. Thank you to this guest for the comments. We always appreciate any feedback :) We just want to clarify that there is a DVD player available, and we did not hear why it was unavailable to this guest. It has been tested and works. Tara properties is an amazing company, they responded in a timely manner and even tried to help us find an additional property at the last minute.. I highly recommend using thus company. The rental property was also fantastic. We could not believe our beautiful view especially from our bedroom. We watched gulls, seals & boats passing by. We saw a bald eagle. We fell asleep to the sound of the water lapping at the sea wall . We walked in the door of this beautiful home to see gorgeous unobstructed views of the ocean and mainland. It is true that staying here is like staying on a boat, as the water comes right up to the breakwall at high tide. The home is adorably appointed and well stocked with all needed appliances. Even the beds were amazing. We absolutely loved it and did not want to leave. We are already planning our next stay there! What a beautiful house this is. At high tide you feel like you are on a boat when you look out at the Sound. At low tide you can poke around on the beach and collect shells. A fantastic getaway just minutes from the ferry. I highly recommend. When we first arrived, we were very nervous due to the long, steep, and winding single lane drive down to the house. Once there, the drive became a moot point of our trip. 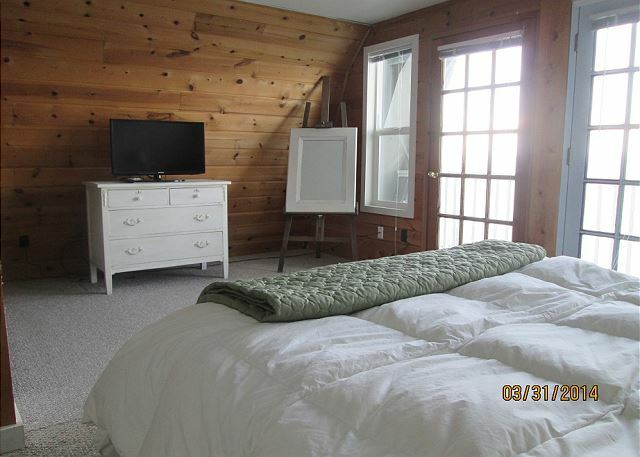 Not only are you on the sound, the master bedroom, kitchen, and living room have the most amazing view of the water. All of the necessities were provided and all appliances were in good working order. The only two minor issues were the kitchen sink being very powerful (was easy to get water everywhere) and the nest of barn swallows under the deck off the master bedroom (bird droppings everywhere and loud chirping early in the morning). Those two things are negligible compared to how tranquil the house is. It was a great weekend and we will definitely return!